Call (480) 418-1635 to book your project today! Concrete slabs or subfloors in the Phoenix Metropolitan area, as well as other areas nationwide, usually require some surface preparation in order to guarantee a perfect installation of the new floor covering. Our experience in thousands of projects, seeing both good, bad and the ugly, allow us to advise on the best methods of flattening your subfloor and what the cost is likely to be. Why is Floor Leveling necessary? Floor leveling is important when installing any type of new flooring to assure it will look it’s very best, be a lasting investment, and meet any warranty requirements. Floor leveling will also eliminate dangerous spots that might cause tripping and provide for the installation of straight and even baseboards. Many surface preparation costs could be prevented by better workmanship at the slab pour stage. Once the concrete has been poured, finished and cures, the only way to remedy an uneven surface is by either concrete grinding (for the high spots) or floor leveling (for low spots). Many times it takes a combination of both to achieve a truly flat floor. What is a Super Flat Floor? Super Flat Floors are subfloors that meet or exceed a flooring manufacturer’s minimum specifications for flatness over the entire area of the subfloor. This means the level of the subfloor will be the same at 15 feet, 20 feet, or even further away from any given point. This type of subfloor has been flattened to the point that there is no appreciable difference in height – no high points or low points anywhere – anywhere, thus the floor is totally flat. The only way to create a subfloor that is flat enough to meet a flooring manufacturers’ specifications is by precision grinding and/or the application of a leveling underlayment. 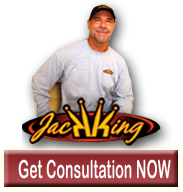 Arizona Home Floors Owner, Jack King, is one of the very few flooring contractors with the equipment and expertise to reliably achieve a Super Flat Floor. With the DustRam® System equipment, this can be done dust free inside an occupied residential home to provide a flooring base that guarantees the beauty and durability of your new flooring installation. We have over $60,000.00 in specialized equipment used to produce Super Flat Floors for our clients. To ensure the subfloor is flat, we incorporate a combination of lasers, aluminum screeds, large and small grinders (part of the DustRam® System equipment), precision levels, and other devices in the process. The video above was taken inside a high-end, custom home, which was occupied. The client had an inset of carpet surrounded by travertine stone. The client wanted to remove the carpet and then replace it with porcelain plank. The issue was the concrete was not only incredibly unlevel, but the travertine was approximately 1-1/2″ above the surface of the concrete. This made it impossible to install the porcelain plank with any precision. The solution was to professionally address these concerns using the DustRam® System equipment for flattening the concrete. This was done with an incredible amount precision and completed dust free without the use of any plastic sheeting! As a homeowner who intends to invest in a beautiful new floor, proper surface preparation will also increase your home’s value. Everyone can appreciate the beauty of a totally flat flooring installation. Baseboards installed over a wavy floor are not attractive! Really large (24″, 36″ and 48″) ceramic and stone tile can be installed with the edges almost touching but without those annoying variances in the height of the individual tiles and without the risk of cracks developing over uneven sections of the subfloor. Wood flooring can be glued down with no “hollow spots” that make noise when you walk on them. It is important to note that “self-leveling underlayments” are only self-leveling if they are applied correctly. Be aware that the leveler is expensive, and if applied improperly, can be even more expensive to correct the mistake. In most instances, leveler is applied using an aluminum screed to control the depth of the leveler. Leveler applied improperly, without careful use of the aluminum leveling screed, can easily be overpoured and create a hump in the subfloor. Once the leveler dries, the hump created by overpouring is extremely difficult to grind down because fully dried leveler takes about four times longer to grind than concrete! In areas receiving leveler, Arizona Home Floors always uses the DustRam® System equipment to completely “profile” the concrete. This means the entire top surface of the concrete (Cream) is removed, exposing the “raw” surface of the concrete. Without this preparation, putting down a primer will not work effectively on old concrete floors since there can be residual paint, drywall, old coating, and adhesives still covering them. Specialized equipment is needed to prepare the old concrete to accept the leveler. Do-It-Yourselfers do not have the right equipment, it cannot be rented, and certain techniques are required to effectively do this type of concrete preparation. In our many years of experience, we have seen entire sections of leveler peel away like a pancake because of improper preparation. You only get one chance to try to do this yourself, and if you get it wrong, professional help to fix it will eliminate any savings you tried to achieve. If you need this type of work done, please give us a call and let us provide you with an estimate. We do it right the First time! The video above was taken in a custom home in Scottsdale. The homeowner’s contacted us after visiting our website and watching a few videos. Their problem was a giant concrete heave in the floor caused by an enormous Ironwood root, so bad they could feel it through the carpet and padding. The size of the concrete heave was by far the largest I had ever seen inside a residential home! It measured a full 1-1/2″ higher than the true elevation it was supposed to be. We had to bond some of the concrete back together with Roadware Concrete Mender to stabilize the slab before flattening it. The homeowners planned to have the offending root removed so the problem would not continue. The video above was taken in the Phoenix Arcadia district, where some concrete is very old and very un-flat. Skeptical? Watch the video to see how un-flat and un-level it really is. See our unique process of preparing the concrete to accept Mapei Ultraplan 1 Plus Leveler and Mapei Ecobond 995 Moisture Vapor Protection System with Sound Deadening Properties. For additional videos fully demonstrating the entire process from start to finish, please visit our Arizona Home Floors YouTube Channel or DustRam™ YouTube Channel. Please contact us today at 480-418-1635 for more information about Arizona Home Floors services and the DustRam® System equipment and processes for floor leveling.